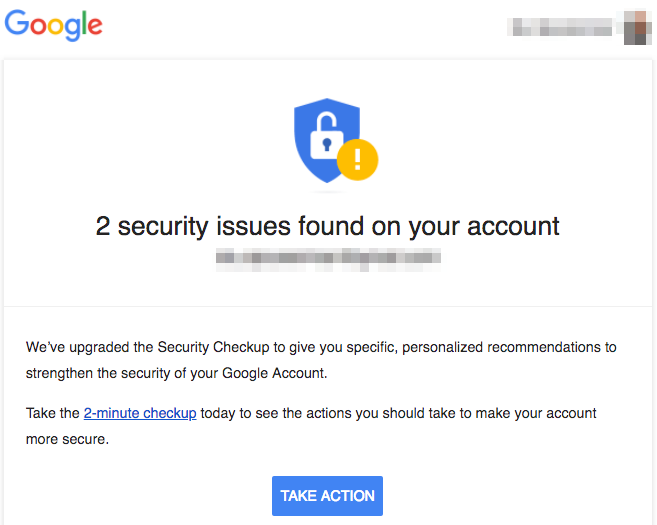 A couple of weeks ago, Google sent out legitimate Security notices to some user accounts affected by security issues. These notifications looked exactly like some commonly-seen phishing attempts. You can see an example of the legitimate Google email below. If you received one of these legitimate Google emails and immediately clicked the link within it, don’t worry, you’re safe. However, you should be very aware that phishing emails can look just as realistic and will cause serious harm to you or your organization if you follow the directions the cyber criminals want you to follow. The key rule to follow whenever you receive an email that seems urgent or security-related is to Stop, Look, and Think. Don’t turn on auto-pilot and click links or open attachments just because the email appears to come from a legitimate source. If the email says your account is affected by an issue, go directly to the source by visiting that website or contact their support team to make sure everything is okay. Do not click links, open attachments, or dial any phone numbers contained within that email. Contact the actual company the email is supposedly coming from. Stop Look Think - - Don't be fooled.